The Climate Workshop – that’s what a new, informal network for LiU employees interested in a little more operative work on the climate issue calls itself. First on the ‘to do’ list is divestment. 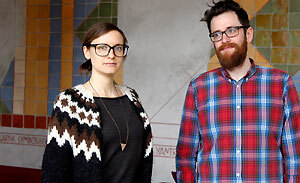 In the Department of Thematic Studies Building sit Björn Wallsten, postdoc in Technology and Social Change, and Anna Kaijser, postdoc in Environmental Change – two of five people who form the core of the newly-founded “Climate Workshop” informal network. The initiative was taken by Mr Hultman, lecturer in Technology and Social Change, and Anna Lundberg, lecturer in Gender Studies, who contacted a few people they thought would be interested in more concrete work for change in LiU and climate issues and who in their research and instruction, or privately, were strongly involved in these issues. “The University is our main arena,” says Mr Wallsten. “Here, we can make things better, pursue issues no one else is. The idea is not to replace what’s already being done, but to supplement, powerfully, what already exists. We can ask the tough questions, call things into question, and – for example – look at the university’s travel habits. The Climate Workshop wants to focus on the right things, and concentrate on issues where real benefit is possible. “Over the long term there is also a branding dimension here,” Mr Wallsten says. LiU has several environmentally profiled programmes. Having investments that don’t tally with that strikes a discordant note. There are also divestment networks among the students, both at LiU and at other universities – involvement that the Climate Workshop appreciates. But the issue is actually already on the University’s agenda. This week, the heads of finance of the country’s higher educational institutions are having a network meeting in which divestment will be an item on the agenda. As noted, the Climate Workshop is a newly-founded network in which a group at the Department of Thematic Studies forms a core. But more people who are interested in the climate are welcome, of course. “You only need to get in touch with us,” say Ms Kaijser and Mr Wallsten.